The 1.8 Turbo tuning is suitable for vehicles whose engine factory uses a turbocharger. Everything you need to see our range of turbo-Parts online shops. The advantages of the 1.8 Turbo tuning are obvious: The car accelerates better, bring a more rounded performance on the road and the driving pleasure is increased significantly. In our assortment we offer both performance kits of plug & play, as well as individual solutions for you. With just one set so you can increase the performance of your vehicle noticeably and save more purchases. Usually, a replacement of the pressure hoses must be made, since this can not withstand the new pressure and inflate or contract for the 1.8 Turbo tuning. The full engine power can then do not cover, which is why silicone tubes are used which have been reinforced with textile materials. In some cases it is also necessary to support the motor with stronger ARP bolts, bearings, forged pistons and H-Shaft Conrods. Especially popular with the 1.8T Tuning the upgrade turbocharger. 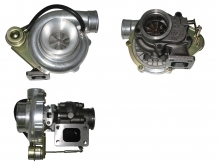 These include, for example, available from us turbocharger upgrade BorgWarner. They have the advantage that the factory-installed turbochargers can be easily replaced by which we purchased model. If such a tuning performed, then some changes are necessary in order to use the full power of the engine and tunings can. For example, the more heated air must be cooled, which is only possible with a larger intercooler. Similarly, the diverter valves should be replaced by the more robust piston valves. To adjust the fuel supply to the new power, replace the injectors and the fuel pump by larger and more powerful models. In an exchange of the exhaust manifold should also not be waived. For conversions with a universal turbocharger a bend is required with T25 flange, also the Y-pipe must be rebuilt. To relieve the Turbo we offer larger, finished welded plug & play down pipes, which include a 200 cells Kat generally. Now missing only two changes: a stronger clutch and the software must be matched to the built-in components with a so-called chip tuning. If you are not yet sure which product fits in our range for 1.8 Turbo tuning to your needs? No problem, because our employees are weekdays for you 9-17 clock both by telephone on 040 - 520 14 231 accessible as well as via email. We also offer a contact form through which you can report your concerns like us also online. You will receive as soon as possible a response from one of our employees. Bei uns kaufen Sie 1.8T Tuning günstig online.